The parróquia of Sant Julià de Lòria is second only to La Massana in its popularity with foreign visitors. 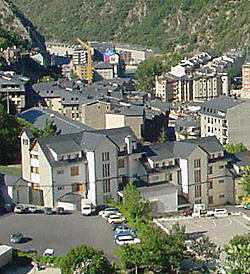 It is situated by the Spanish border and receives less snow than other regions of Andorra. Relatively undeveloped, Sant Julià de Lòria is peaceful and famous for its postcard-pretty collection of farmhouses, drying barns, and Romanesque churches situated on verdant fields. Sant Julià de Lòria is also the principality’s main tobacco-producing region. Its capital is the city of Sant Julià de Lòria, once known as Lauredia. The ancient Iberian and Roman coins unearthed here prove the city’s age. Churches like the Sant Serni de Nagol and the Sanctuary of Canolic have preserved their original, 11th to 13th century Romanesque architecture. The tobacco industry has been very important to Andorra’s economy, and the Museu del Tabac in this city provides tourists with information on its long history. Property here is slightly less expensive than in La Massana. The city has many apartment buildings and very expensive detached houses, although it is much harder to find a house that is for sale, as these very seldom go on the market. Juberri is a small village near the Spanish border, overlooking a valley. Its peaceful surroundings, grey stone houses and small village streets make it a quaint, rustic alternative to the more active tourist hotspots and big ski resorts.